Got Poles? Now What Do You Do? Congratulations! You’ve made the commitment to fitness, bought some poles and can’t wait to get started. But just how do you do that? 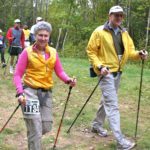 Nordic walking is easy to learn but there is definitely some technique to using the poles that will help you get started safely and effectively. Without any introduction many people will begin with their poles out in front of them, tips reaching forward and hands up high in the air. This is opposite to what you would learn in a class or from a good video. Your poles are designed to be used at an angle behind you, following your arm swing and landing just behind the heel of your front foot. Take the time to watch a video or find a class near you to make sure you set the poles for the correct height and you get started on the right foot and left arm. Yes you will be walking and swinging your arms in opposition, just like you do when you walk without poles. Contact me with questions or help finding instruction in your community. Posted in Uncategorized	| Comments Off on Got Poles? Now What Do You Do? I got new walking shoes this week! 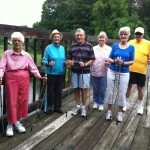 Nordic walkers need a pair of poles in their hands and a good pair of walking shoes on their feet. There are many different brands out there and they all fit different shaped feet and walking styles. Find a shop that will measure your foot, make sure you have a good fit with plenty of toe room and lots of support, and then watch you walk in the shoes to help determine if it’s the right shoe for you. Like the tips on your poles your shoes will wear out. What are the symptoms of a dead shoe? Even if the top of the shoe looks ok you need to turn that shoe upside down and look at the bottom. If you’ve worn down the tread or the heels it’s time. The other common symptom is that something will start to hurt, like a knee, hip or back. New twinges are a sign that something has changed and the first thing to check is those shoes. I had to listen to my own advice this week. My knee has been talking to me of late and I realized I was overdue for new walking shoes. With new shoes on my feet I am once again smiling all the way down the road! I woke up to new snow on the ground here in Bozeman Montana, it’s our winter home featuring lots of skiing up at Big Sky! 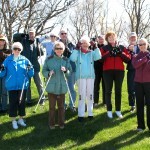 Funny thing about that snow, it made me think of spring time and Nordic walking. So I spent my day updating my calendar with upcoming classes and special programs. Most of them have links inserted so you can register online. As promised I’ve already scheduled some Beyond the Basics Classes and look forward to adding more as the season gets under way. Consider this your invitation to join me at a class or a walk. It will soon be time to put away that winter gear and layers and step out with your poles! I hope to see you soon! If the arctic deep freeze outside is making walking difficult or maybe even impossible to do here’s some ideas of indoor walking spaces in and around the Twin Cities in Minnesota. If you live in another cold area you might look at similar locations in your community. Be aware that many surfaces at malls and indoor walking tracks are not pole friendly. Always check with the facility before you bring your poles. But even if you have to do a vanilla walk it’s better than no walk at all! Shopping Malls Most of the indoor shopping malls are open early for walking. Check for the schedule and which doors are open. Plan to leave your valuables at home and run in fast without your coat. Burnsville, Eden Prairie, HarMar, Knollwood, Ridgedale, Rosedale and Northtown to name a few. Minneapolis Skyways Get up and enjoy the view from the skyway system. Make it an adventure and be aware that some of them are not open past business hours. Plymouth Creek Center Fieldhouse 14800 34th Ave N.
The Oval, Roseville 2661 Civic Center Dr Free, Check their online calendar, and call before going in case of last-minute changes. Be aware, the space is cold because it’s up behind the ice rink. Make 2017 the year that you stick with your resolution! Pick up 2 special sticks and become a Nordic Walker, improving your overall health and well being as you make walking fun again! It’s easy to get started, really all you need is Nordic Walking poles, good walking shoes and an attitude. The poles and shoes are the equipment, the attitude will help you get past the feeling that everyone is watching you and wondering just what the heck you are doing with those poles. But never mind those who don’t understand the power of the poles. Simply smile when they ask if you forgot your skis or if there’s snow in the forecast. 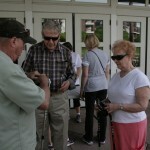 Tell them it’s Nordic walking and let them do some searching. Sometimes self discovery is the best way. Be sure to check for classes and groups in your area. My spring classes have been confirmed and I’m working on updating my calendar. If you have questions about poles or those first steps let me know! I love to talk sticks. To slip or not, that is the question. If your sidewalks and trails are now covered in snow your poles may be slipping just a bit instead of giving you the stable grip for your push that you’re used to having in warmer seasons. What to do? First you can simply take off the rubber boot tip, put it where you’ll be able to find it and walk with the bare metal tip. LEKI flex tips feature a carbide tip that is very hard and actually concave so they provide excellent grip on hard cold surfaces. If you remove the tip be sure to lengthen your poles about 2 cm so they won’t feel short while you’re walking. Your other option, one that works well if you’re moving along a trail that is mixed frozen cement and snow and ice, is to get a pair of LEKI studded traction tips. This is my husbands favorite as he doesn’t like the noise of the bare tip on cement and pavement. The small carbide spikes work similar to a studded snow tire and provide excellent grip on your winter walks. Don’t let the ice and snow keep you from enjoying your poles! and be sure to get a pair of shoe grips for the bottom of your walking shoes. Congratulations to the city of Willmar for becoming the most recent community to be recognized as a Parkinson’s Friendly City in Minnesota. It makes a big difference for those living with Parkinson’s and their family to have better understanding and support in the community. 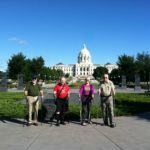 Many of the fitness programs in Willmar are leading exercise classes and activities that are easier for persons living with Parkinson’s to enjoy. 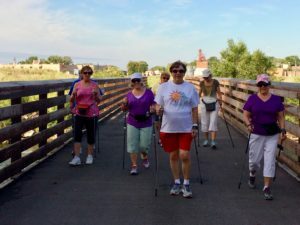 I am excited to be working with the Community Ed program to lead a special Taste of Nordic Walking for Parkinson’s on Tuesday September 20, 3-4:30 pm. 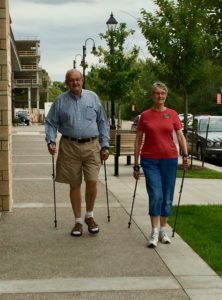 Nordic Walking adds balance, improves posture and encourages the symmetry of moving your whole body while walking. It’s a great way to apply the Big Movements recognized to help with the symptoms of Parkinson’s. 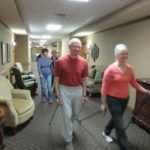 This class is also appropriate for seniors or others with mobility limitations that would like a slower paced class. Registration is now open, the fee is $3. As always poles will be available for use during the class, dress for the weather as we will be going outside, and come prepared for lots of fun and the joy of learning something new. 2016 Fall Classes on the Calendar! 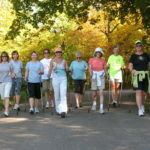 Fall is my favorite time of year to walk and Nordic Walking is my favorite walk! Join me for a Taste, a one time Intro, a 3 part Become a Nordic Walker or Beyond the Basics in a community ed program near you! Check out the calendar for dates and times. Links will be available as soon as the websites are updated for fall. As always if you don’t see one near you get a group of friends together for a private class. It’s fun, easy to learn and a great time to share with friends! Posted in Uncategorized	| Comments Off on 2016 Fall Classes on the Calendar! I went for a quick walk this morning, 2 miles to start my day with a paddle and a round of golf planned for later. It was indeed a quick walk – 2.34 miles, average pace 13:55 per mile, 4,400 steps and 279 calorie burn. I don’t often average below 14 minutes per mile but this morning I found my pace and moved quickly down the trail. It felt really good! I use map my walk to coach me on the trail and keep track of my walks. I have a fitbit and in the past had a garmin to track my daily activity. My cell phone has a health app and will track my steps all day long if it’s in my pocket. I wear a watch so I can track minutes if nothing else. So I’m counting all day long. But my walk doesn’t really count if I’m not working my poles and challenging myself to keep a pace and pressure on the poles. I know I can walk forever at 15 minutes per mile so I need to increase my pace if I want to get my heart rate up. I know I can take it easy on the poles but to increase the workout and the upper body strength I need to apply maximum pressure and follow through on my poles. When I reach that goal I find my “runner’s high” and the miles fly by! How do you count your walk? Do you work your poles or just take them for a walk? If you’ve been walking with poles it’s time to put the pressure on and make that walk count! I have some Beyond the Basics clinics coming up, designed for the experienced Nordic walker who wants to take the next step and learn to really work those poles. Join me! It’s a small world. Yesterday I was on my way to deliver a set of LEKI Carbon Travellers to a gentleman in New London, MN. 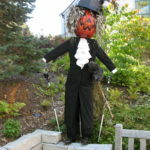 He had met some Nordic walkers from my classes while walking on the trail. He stopped them, asked questions about the poles and got my contact information. The next day he saw another Nordic walker while walking and decided it was a sign that he needed to call me about getting started. Random contact, but that’s how it so often happens with the poles. I had agreed to meet him at the middle school playground for the hand off and a quick introduction to get him started with his poles. As I waited for him to arrive I got a call on my cell. I hesitated to answer it as there was no caller ID. Imagine my surprise to discover that it was a man from India! Ranjit had just received his Carbon Travellers, found my website and blog and called to get his questions answered in person from the queen. We had a delightful conversation and he followed up with an email this morning. Serendipity? Coincidence? The universe works in mysterious ways but I am now connected to two more Nordic walkers, one going to Germany this fall and the other living on the other side of the world. 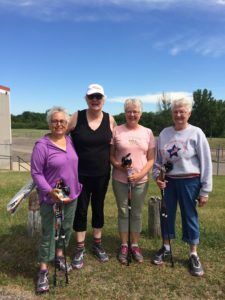 The joy of walking with poles is our common bond and I look forward to hearing about their new adventures with Nordic walking. What is your story? I’d love to hear about it! Posted in Nordic Walking, ponderings	| Comments Off on The Queen goes global!